These data include statewide Oregon Democratic and Republican registration data since World War II. Half of the best Republican years were during the 40s and 50s. The other half were during the 90s and 00s. The ratio of Democratic to Repbulican voters is one way to assess partisan strength. The index measures the ratio of Democratic voters to Republican voters. The geographic pattern is pretty clear. 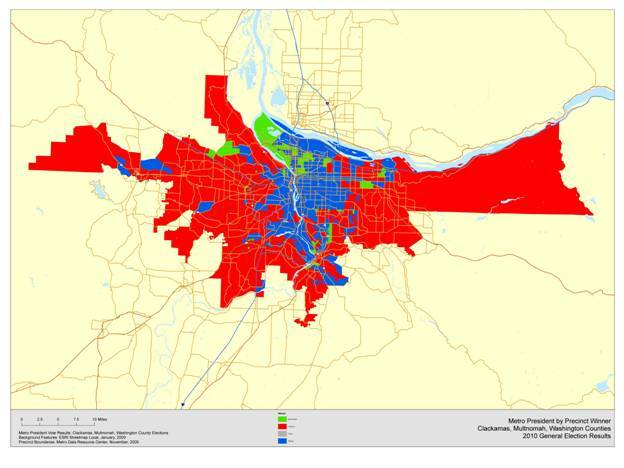 Hughes (red) won outside central Portland. 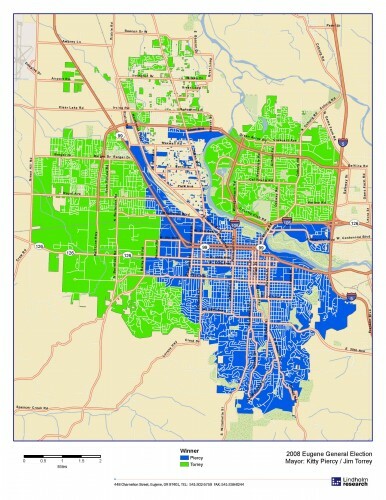 Stacey (blue) and Burkholder (green) won the more central areas. Sources of precinct returns: Clackamas County Elections, Multnomah County Elections, and Washington County Elections. Source of map data: Metro RLIS. Voters were included if they were identified based on surname and personal name or lived in a neighborhood that was 70-79% African-American. As a baseline for comparison, an analysis of all California voters is posted at: http://lindholmcompanyblog.com/?p=1542. The Democratic advantage increased steadily until the mid 1970s. Since that time it declined steadily until a sudden uptick in 2008. The ratio of Democratic to Repbulican voters is one way to assess partisan strength. The index measures the ratio of Democratic voters to Republican voters. Eugene’s politics are famously divided. Below is a map of the precinct results from the 2008 Mayoral Election. The map colors come from the logo colors for the two campaigns: Piercy is blue and Torrey is green. For a more detailed look, please see the 2008 Eugene Mayoral Results by Precinct. By way of comparison, here is an earlier post the precinct-by-precinct returns for San Jose: http://lindholmcompanyblog.com/?p=692. It is not directly comparable because the map is scaled rather than dichotomous and Reed defeated Chavez by a wide margin. However, very few Eugene precincts were not landslide victories, so scaling would have little impact. Source of data: Lane County Elections. Source of precinct boundaries: LCOG. Voters were included if they were identified based on surname and personal name or lived in a neighborhood that was 80-89% African-American. The best years were mostly during the 60s, 70s, and early 80s. 2008 is the one year outside this period. The difference between the Democratic and Repbulican registration percentages is one way to assess partisan strength. Restricting Taser use is narrowly supported, 45% to 42%, by Eugeneans. The key demographic distinction is by geography. South Eugeneans (Wards 1, 2, and 3) support (60% support to 31% oppose) and Eugeneans from other wards (Wards 4 through 8) oppose (37% support to 49% oppose). Do you support or oppose restricting police Taser use to cases that require deadly force? IF SUPPORT OR OPPOSE: Is that strongly or somewhat? The survey consists of 200 live telephone interviews of likely Eugene 2010 General Election voters conducted June 14-15, 2010. The margin of error at the sample median is plus or minus seven percent. This research was conducted has part of an ongoing long-term research project and no client paid for any part of this work. Voters were included if they were identified based on surname and personal name or lived in a neighborhood that was 90-99% African-American.